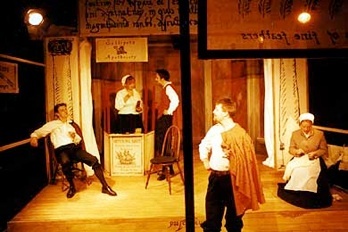 On this trip I made my first-ever visit to a pub theatre, the Finborough Arms, to see Steam Industry's production of THE ROARING GIRL, a comedy from 1614 by Thomas Middleton and Thomas Dekker. (This sort of theatre in London falls under the category of "fringe" theatre.) The theatre, which is literally above a pub, boasted a playing area transformed by designer Cleo Pettitt into a tiny Globe-like three-quarter thrust stage with room around the sides for at most 50 audience members. A side benefit of its situation is that you can bring beverages from the pub below to enjoy during the performance. Steam Industry normally specializes in new plays, so this excursion into the 17th century was quite unusual, but one could easily see the attraction of the material. This raucous comedy must be the most feminist play of the period. The title character, Moll Cutpurse, played with gusto by Joanna Van Kampen, is based on a real woman of the time, Mary Frith, who was constantly being arrested for swearing, carrying a sword, gambling and wearing men's clothes. Surprisingly, the playwrights are completely on her side and the play mocks the superior attitude of every one of the male characters. As one might expect the play was done on a very low budget, but as so often happens, wit and imagination provided more than enough compensated. Costume designer Mia Flodquist cleverly modified modern suits and shirts modified to suggest Jacobean outfits and the cast brought comic awareness to the artificiality of the cut-out props. The energetic cast spoke verse as clearly as the RSC and Abigail Anderson provided the inventive direction. The production is the first time the play has been presented in London since 1983 when Helen Mirren played the role for the RSC. This is a play that really should be part of the regular repertoire since it provides such a useful antidote to such plays as The Taming of the Shrew. It is always a pleasure to see a rarity brought to life, even more so when the play has been so unjustly neglected. 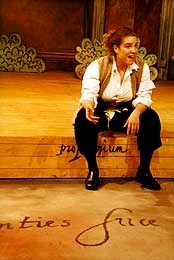 Photo: (top) a scene from The Roaring Girl; (bottom) Joanna Van Kampen as Moll Cutpurse. ©2000 Cleo Pettitt.